Perfect for your master bedroom or guest room, the Amish Schwartz Mission Chest on Chest with Seven Drawers offers elegant mission style furniture to provide style and storage. This solid wood mission chest features seven spacious drawers in a variety of sizes to provide room for everything you need. This Amish bedroom chest is handcrafted by skilled Amish woodworkers with a lifetime of experience. The Schwartz Mission Chest is shown here in oak wood which is celebrated for its strength, beauty, and durability. Two spacious drawers at the bottom provide room for blankets and linens. Three long drawers in the top chest offer space for foldable items while the two compact drawers at the very top are perfect for delicate items. Consider the Amish Schwartz Mission Lingerie Chest to hold delicates and accessories. 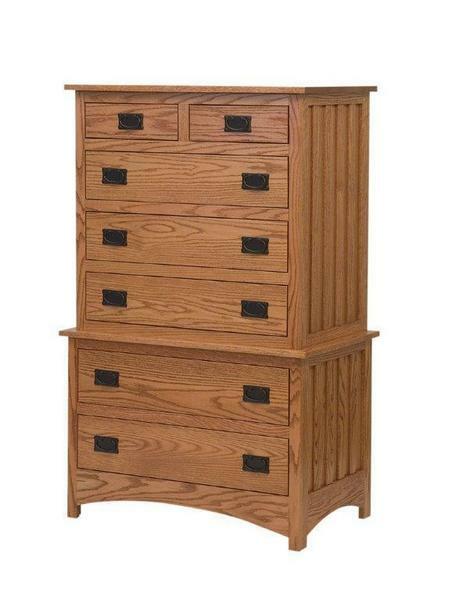 All of our Amish bedroom furniture is completely customizable. You select the wood and stain to design a mission chest that is uniquely yours. Select felt lined sliding jewelry trays or cedar bottom drawers for your Amish mission chest. Be sure to review our line of Bedroom Benches for some stylish bedroom seating options. Call one of our Amish Furniture Specialists today at 866-272-6773 with any questions.